One alternative put forward is thorium. There are about four times more known thorium than uranium reserves and a thorium reaction works differently, so the fuel lasts longer. It is also said that thorium reactors would be safer, produce much less waste, and avoid the risk of nuclear weapon proliferation. They also offer a tantalising solution for burning up uranium fuel waste. The atomic properties of thorium have been known since the 1930’s, and the first thorium reactor was constructed in the 1950’s at Oak Ridge in the USA. In 2013, the IAEA stated that it is “possible that thorium will be used as a nuclear fuel in the foreseeable future”. 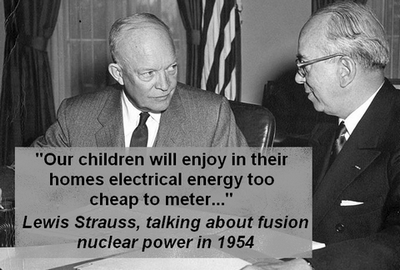 So why, after 60 years, are there no commercial thorium reactors in the world today? There seems only one logical answer: they cannot compete on economic grounds. In other words, they are more expensive. The cost of nuclear power is already an issue, so an even more expensive technology is unlikely to succeed. The simple logic of the above seems enough of a reason to forget about thorium as a nuclear fuel, but for those who are interested, let us examine the other alleged advantages of thorium. Thorium reactors could operate at a lower internal pressure than current reactors, and so could include additional passive safety features to avoid some of the risks of pressurised water reactors, such as hydrogen explosions. However, there is only one way to be sure about the safety of a new technology, and that is to try it and see. After all, the reactors at Chernobyl, Three Mile Island, and Fukushima were all considered safe when they were designed. Since so few thorium reactors have been built and started up, we don’t have enough data yet to tell. The total world wide generating capacity of breeder reactors (which can use thorium fuel) is 580MW. This is about a quarter of the power of the Koeberg plant, and only 0.16% of global nuclear generating capacity. Unlike existing reactors which use water as a coolant, breeder reactor designs such as those for thorium require a different coolant, and molten salt, molten sodium metal, and molten lead have all been considered. These are all highly corrosive substances, and one of them (sodium) catches fire when exposed to air. Molten lead can corrode through a stainless steel pipe within days. So while safer in some respects, there are also several new safety issues for these designs to contend with. The simple fact is that at the moment we don’t know how much safer thorium reactors would be during normal operation. We do know that they would still be susceptible to sabotage, and we have learned from Fukushima that some natural disasters such as a magnitude 9 earthquake are so powerful that nothing man-made can withstand them. What about nuclear weapon proliferation? The by-products of the thorium reaction are far more radioactive than from current reactors, and so the design of these reactors usually includes an on-site reprocessing plant to avoid transport or handling of the waste. Reprocessing separates the waste, and converts some of it back into usable nuclear fuel. This waste contains far less plutonium than other spent nuclear fuel, and far more uranium-233. For this reason, it is sometimes said that thorium would avoid the risk of enabling the manufacture of nuclear bombs. But uranium-233 can be used to make a nuclear bomb, as was done in the Operation Teapot bomb test in the USA in 1955. Its a bit harder than using plutonium, but it can be done. When it comes to ‘dirty bombs’, uranium-233 works just fine. So thorium cannot be said to solve the proliferation problem. There is still waste from the reprocessing plant, and while this is initially even more highly radioactive than spent fuel from current reactors, it does diminish in radiation far faster. However, the reactor vessel, and other parts of the reactor building will become high level nuclear waste once the plant is shut down. Medium level waste will still be produced during maintenance operations, and low level waste such as radioactive overalls and gloves will continue to need a place for disposal. So thorium does not eliminate the problems of high, medium or low level radioactive waste. The nuclear industry has consistently found new technologies to be more expensive and more dangerous than at first thought. Thorium reactors would be more expensive than current nuclear technology, and would not completely solve any of the safety issues of nuclear power. This entry was posted in Government, International, Nuclear waste. Bookmark the permalink.